(James Nord | The Associated Press) In this July 9, 2015, file photo, Seth Jeffs, right, the brother of Warren Jeffs, the imprisoned leader of a polygamist sect, participates in a state water board meeting in Pierre, S.D. A South Dakota lawmaker frustrated with what he views as inaction over the sect's outpost in his district wants legislators to look into the compound. Grand Marais, Minn. • A company tied to a man who led a secretive polygamous sect’s compound in South Dakota has purchased about 40 acres of land in northern Minnesota. Jeffs is the brother of Warren Jeffs, imprisoned leader of the Fundamentalist Church of Jesus Christ of Latter-Day Saints. 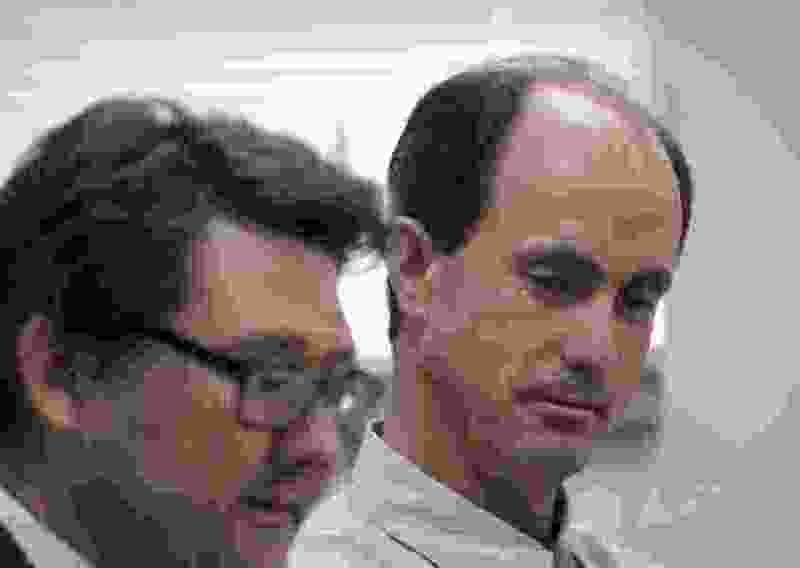 Authorities have said Seth Jeffs led the sect's South Dakota Black Hills compound, which has raised concerns among nearby landowners and a Republican state lawmaker who unsuccessfully pushed legislators to look into the outpost. Seth Jeffs, who took a plea deal in a multimillion-dollar food-stamp fraud case in 2016, applied in August to build a 5,760-square-foot building on the Minnesota land; the permit was approved in December, but officials say the pole building hasn't yet been constructed. The county values the property at $57,300. Jeffs didn't immediately respond to an email seeking comment from The Associated Press. His brother, Lyle Jeffs, was sentenced in 2017 to prison for his role in carrying out the food stamp fraud scheme and for escaping home confinement while awaiting trial. He was caught in South Dakota after pawn shop workers spotted him and called police. The FLDS opened the 140-acre compound near the town of Pringle, South Dakota, more than a decade ago. Known to the faithful as "R23," the compound sits along a gravel road, secluded by tall pine trees, a privacy fence and a guard tower.